Not to be confused with evaporated milk or powdered milk. Condensed milk is cow's milk from which water has been removed. It is most often found in the form of sweetened condensed milk (SCM), with sugar added, and the two terms "condensed milk" and "sweetened condensed milk" are often used synonymously today. Sweetened condensed milk is a very thick, sweet product which when canned can last for years without refrigeration if not opened. Condensed milk is used in numerous dessert dishes in many countries. A related product is evaporated milk, which has undergone a more complex process and which is not sweetened. Evaporated milk is known in some countries as unsweetened condensed milk. According to the writings of Marco Polo, in the 13th century the Tatars were able to condense milk. Marco Polo reported that ten pounds (4.5 kg) of milk paste was carried by each man, who would subsequently mix the product with water. However, this probably refers to the soft Tatar curd (katyk), which can be made into a drink (ayran) by diluting it, and therefore refers to fermented, not fresh, milk concentrate. Nicolas Appert condensed milk in France in 1820, and Gail Borden, Jr., in the United States in 1853, in reaction to difficulties in storing milk for more than a few hours. Before this development, milk could only be kept fresh for a short while and was only available in the immediate vicinity of a cow. While returning from a trip to England in 1851, Borden was devastated by the deaths of several children, apparently from poor milk obtained from shipboard cows. With less than a year of schooling and following a series of failures, both of his own and of others, Borden was inspired by the vacuum pan he had seen being used by Shakers to condense fruit juice and managed to reduce milk without scorching or curdling it. Even then his first two factories failed and only the third, built with new partner Jeremiah Milbank in Wassaic, New York, produced a usable milk derivative that was long-lasting and needed no refrigeration. Probably of equal importance for the future of milk production were Borden's requirements (the "Dairyman's Ten Commandments") for farmers who wanted to sell him raw milk: they were required to wash the cows' udders before milking, keep barns swept clean, and scald and dry their strainers morning and night. By 1858, Borden's milk, sold as Eagle Brand, had gained a reputation for purity, durability and economy. In 1864, Gail Borden's New York Condensed Milk Company constructed the New York Milk Condensery in Brewster, New York. This was the largest and most advanced milk factory of its day and was Borden's first commercially successful plant. Over 200 dairy farmers supplied 20,000 gallons (76,000 litres) of milk daily to the Brewster plant as demand increased driven by the American Civil War. The U.S. government ordered huge amounts of condensed milk as a field ration for Union soldiers during the war. This was an extraordinary field ration for the 19th century: a typical 10 oz (300 ml) can contained 1,300 calories (5440 kJ), 1 oz (28 g) each of protein and fat, and more than 7 oz (200 g) of carbohydrate. Soldiers returning home from the war soon spread the word, and by the late 1860s condensed milk was a major product. The first Canadian condensery was built at Truro, Nova Scotia, in 1871. In 1899, E. B. Stuart opened the first Pacific Coast Condensed Milk Company (later known as the Carnation Milk Products Company) plant in Kent, Washington. The condensed milk market developed into a bubble, with too many manufacturers chasing too little demand. By 1912, high stocks of condensed milk led to a drop in price and many condenseries went out of business. In 1911, Nestlé constructed the world's largest condensed milk plant in Dennington, Victoria, Australia. In 1914, Otto F. Hunziker, head of Purdue University's dairy department, self-published Condensed Milk and Milk Powder: Prepared for the Use of Milk Condenseries, Dairy Students and Pure Food Departments. This text, along with the additional work of Hunziker and others involved with the American Dairy Science Association, standardized and improved condensery operations in the United States and internationally. Hunziker's book was republished in a seventh edition in October 2007 by Cartwright Press. The First World War regenerated interest in, and the market for, condensed milk, primarily due to its storage and transportation benefits. In the US the higher price for raw milk paid by condenseries created significant problems for the cheese industry. Raw milk is clarified and standardised, and is then heated to 85–90 °C (185–194 °F) for several seconds. This heating process destroys some microorganisms, decreases fat separation and inhibits oxidation. Some water is evaporated from the milk and sugar is added until a 9:11 (nearly half) ratio of sugar to (evaporated) milk is reached. The sugar extends the shelf life of sweetened condensed milk. Sucrose increases the liquid's osmotic pressure, which prevents microorganism growth. The sweetened evaporated milk is cooled and lactose crystallization is induced. Condensed milk is used in recipes for the popular Brazilian candy brigadeiro (where condensed milk is the main ingredient), key lime pie, caramel candies, and other desserts. 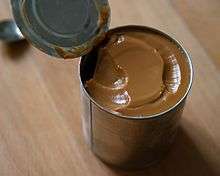 When a can of sweetened condensed milk is completely covered (at all times) by water, and once it starts to boil left to simmer between two and three hours, the content will turn into dulce de leche. In parts of Asia and Europe, sweetened condensed milk is the preferred milk to be added to coffee or tea. Many countries in Southeast Asia, such as Vietnam and Cambodia, use condensed milk to flavour their coffee. In Malaysia, teh tarik is made from tea mixed with condensed milk, and condensed milk is an integral element in Hong Kong tea culture. In the Canary Islands, it is served as the bottom stripe in a glass of the local café con leche and in Valencia it is served as a café bombón. A popular treat in Asia is to put condensed milk on toast and eat it in a similar way as jam and toast. 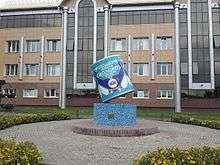 In West Yorkshire, in the years after World War II, condensed milk was an alternative to jam. Nestlé has even produced a squeeze bottle similar to Smucker's jam squeeze bottles for this very purpose. Condensed milk is a major ingredient in many Indian desserts and sweets. While most Indians start with normal milk to reduce and sweeten it, packaged condensed milk has also become popular. In New Orleans, sweetened condensed milk is commonly used as a topping on chocolate or similarly cream-flavored snowballs. In Scotland, it is mixed with sugar and butter then boiled to form a popular sweet candy called tablet or Swiss-milk-tablet, this recipe being very similar to another version of the Brazilian candy brigadeiro called branquinho. In some parts of the Southern United States, condensed milk is a key ingredient in lemon ice box pie, a sort of cream pie. In the Philippines, condensed milk is mixed with some evaporated milk and eggs, spooned into shallow metal containers over liquid caramelized sugar, and then steamed to make a stiffer and more filling version of crème caramel known as leche flan, also common in Brazil under the name pudim de leite. In Mexico, sweetened condensed milk is one of the main ingredients of the cold cake dessert (the leading brand is "La Lechera", the local version of Swiss Milch Mädchen by Nestlé), combined with evaporated milk, Marie biscuits, lemon juice, and tropical fruit. In Brazil, this recipe is also done exchanging fruit for puddings, most commonly vanilla and chocolate, known as torta de bolacha. It is also used to make homemade dulce de leche by baking it in an oven. In Brazil, this is done by baking the unopened can in a bain-marie, the result being doce de leite. In Britain and Ireland, the contents of a boiled can is used as the layer between biscuit base and the banana and cream level in banoffee. In Latin American and Central American countries, condensed milk (along with evaporated milk and whole milk or canned cream) is used as a key ingredient in the popular tres leches cake dessert. In Jamaica, Guinness Punch is prepared using condensed milk mixed with bottled stout. This is often flavoured with nutmeg and cocoa. During the communism era in Poland, it was common to boil a can of condensed milk in water for about three hours. 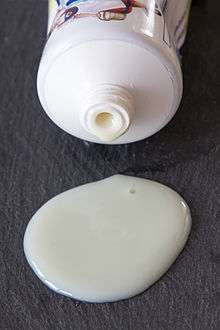 The resulting product – a sweet semi-liquid substance which can be used as a cake icing or put between dry wafers – essentially the same as dulce de leche, is called kajmak (although the original kaymak is a product similar to clotted cream). Homemade kajmak is less common nowadays, but recently some manufacturers of condensed milk introduced canned, ready-made kajmak which now is widely commercially produced, and is a national favourite for the sweets fillings. In Russia, the same product is called варёная сгущёнка (varionaya sguschyonka, translates as "boiled condensed milk"). One of Russia's most famous cakes, "bird's milk cake", is often made with condensed milk. 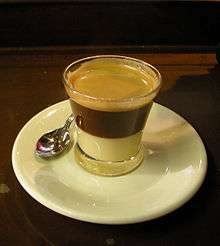 Other drinks containing condensed milk are the Vietnamese iced coffee, a coffee recipe from Vietnam, and the Asiático, a popular drink of the Campo de Cartagena. Condensed milk can be made from evaporated milk by mixing one measure of evaporated milk with one and a quarter measures of sugar in a saucepan, then heating and stirring the mixture until the sugar is completely dissolved, then cooling. It can also be made by simmering regular milk and sugar, until it is reduced by 60%. ↑ "Manufacture of sweetened condensed milk" (PDF). silverson.com. Retrieved 2015-03-26. Sweetened condensed milk (SCM) is concentrated milk to which sugar has been added to act as a preservative. It differs from unsweetened evaporated milk, which is preserved by sterilization at high temperature after packaging.Typically, SCM contains around 8% fat, 45% sugar, and 20% solids-non-fat. The finished product is mainly used in the manufacture of confectionery and chocolate. ↑ Pearlman, Ann; Bayer, Mary Beth (2010). The Christmas Cookie Cookbook: All the Rules and Delicious Recipes to Start Your Own Holiday Cookie Club. Simon and Schuster. pp. 197–. ISBN 978-1-4391-7693-1. ↑ Van, Alexander (2014). 10 Ways to Use Condensed Milk (Recipe Book). Sam Enrico Williams. pp. 4–. ↑ "CARNATION FAQs". Nestlé, Carnation FAQs. Retrieved 20 January 2016. ↑ Becksvoort, Christian; Sheldon, John (1998-09-01). The Shaker Legacy: Perspectives on an Enduring Furniture Style. Newtown, CT: Taunton Press. p. 13. ISBN 1-56158-218-2. ↑ Borden's gravestone epitath is "I tried and failed, I tried again and again, and succeeded". Snodgrass, Mary Ellen (2004). Encyclopedia of Kitchen History. Routledge. p. 102. ISBN 978-1-135-45572-9. ↑ Dudlicek, James (March 2008). "Renewed focus: a decade after its formation, DFA adjusts its outlook to secure the future for its member owners". Dairy Foods. Retrieved 2008-06-26. ↑ "New York Milk Condensery, Borden's Milk". Southeast Museum. Retrieved 2008-06-26. ↑ Bélanger, Claude (2005). "Dairying in Canada". L’Encyclopédie de l’histoire du Québec / The Quebec History Encyclopedia. Marianopolis College. Retrieved 2008-06-26. ↑ "Historical timeline" (PDF). Société des Produits Nestlé SA. Archived from the original (PDF) on September 5, 2007. Retrieved 2008-06-26. 1911 Dennington Condensed Milk factory built (largest in the world during the war). ↑ Pauly, William H (1918). "Condensery competition with factories". Proceedings of the Wisconsin Cheese Makers' Association annual conventions 1916-17-18. Madison, WI: Wisconsin Cheese Makers' Association: 155–165. Retrieved 2008-06-26. ↑ Goff, Doug (1995). "Concentrated and Dried Dairy Products" (PDF). Dairy Science and Technology Education Series. University of Guelph, Canada. Archived from the original on 1999-09-27. Retrieved 2008-06-26. ↑ "Jamaican Guinness Punch Recipe". WBLK. Retrieved 19 February 2016. ↑ "Substitute for Condensed Milk". www.Ochef.com. Food News Service. Retrieved 2010-11-28.